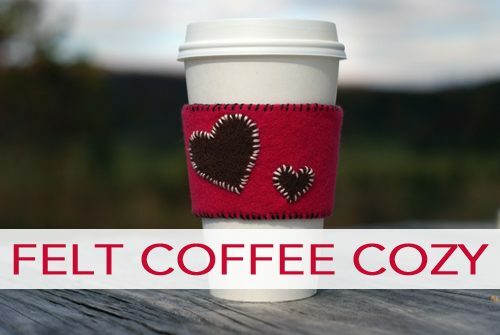 Isn’t this felt coffee cozy so much fun? And the best part is you can customize it with any shape or design — white snowflakes, a Christmas tree, an apple for a teacher, embroidered names, etc. It’s also a really easy project. While I like the look of the hand sewn edges, they don’t need to be perfect, so even a beginner can handle these stitches. And if you really want to avoid needle and a thread, you could switch to fabric glue instead! Cut out the shapes for your design. Place your shapes on the outside piece of felt and pin in place . Stitch around the edge of each shape to secure it in place. Tie the ends on the backside when you’re done. Pin the two layers of felt together and shape like a coffee sleeve. Insert both layers of the flap between the layers on the wide end. You’ll stitch through all four layers to secure them in place. Stitch around the top and bottom edges of the felt with a simple whipstitch. When you’re done stitching, use fabric glue to glue the end of the felt down on the back. Give your cozy some flexibility by cutting off the end flap and adding a button to one end and an elastic band to the other. Glue the edges instead of sewing them. Use the template to cut out coffee sleeves from festive scrapbook paper for a holiday party.